This picture got my attention this morning on my Facebook feed. 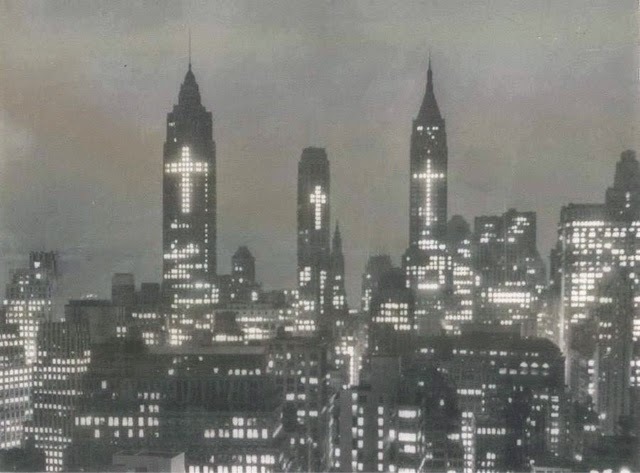 The New York City skyline during Easter 1956. Can you even imagine the outrage of this was attempted in this day and age or political correctness? There would be a huge campaign, by some group of activists who literally have nothing better to do,to have this horribly "intolerant" display that is forcing someone else's religious view down our throats taken down. My have time's changed. There used to be a time when a simple display like this for an important religious holiday for major religion in this country wouldn't bother non-believers. Unfortunately now we leave in a time when it seems no one can do anything without a protest by people who have nothing better to do than protest. We've been over ran by adult children.